Initialed and dated lower left: "A.P. 92'"
Titled, initialed, dated, and signed verso: "sky above your life / A.P. © 1992 / A. Portilla"
Titled, dated, signed, initialed verso: "cat and canary / 2015 / Alexis Portilla © / A.P." 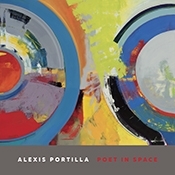 Alexis Portilla: Poet in Space at Hollis Taggart Galleries turns a retrospective eye on the past two decades of Portilla’s career, tracking the artist’s interests in organicism and scientific thought through his layered compositions. His works contain an expressive sense of depth that is both wholly contemporary and suggestive of more established modernist methods. Portilla’s meticulous consideration of surface results in vibrating, active planes of color that interact in unexpected ways, creating what artist and mentor Will Barnet called “a constant sense of expansion.” Color in Portilla’s paintings is not mixed, but layered, often many times over. Scraping and incising reveal multiple vibrant underlayers and give his work an atmospheric feeling of barely-glimpsed space. 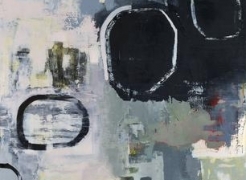 In compositions that have evolved from earthy abstractions to celestial constructions, Portilla encourages viewers to investigate the intricacies of line, texture, and depth. Portilla (b. 1965) holds an MFA from Columbia University and a BFA from the Pratt Institute. His work can be found in the collections of over 250 individuals and institutions, including The New York Public Library and Penn State University, and has been exhibited at galleries and museums throughout the United States. He lives and works in New York.